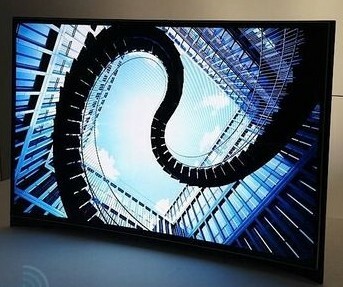 Samsung Electronics Co., Ltd. unveiled its Curved OLED TV, breaking the barrier of innovation in home entertainment at the 2013 International Consumer Electronics Show (CES). Samsung’s Curved OLED TV creates a panorama effect not possible with flat-panel TVs, offering a more immersive viewing experience. When users watch captivating content such as vast landscapes and scenes from nature on the Curved OLED TV, the display enhances the content, allowing the viewer to be encompassed by the beauty of the images. Leveraging its expertise in display technology, Samsung has optimized the viewing experience of the Curved OLED TV to deliver a comfortable viewing experience, as the curved panel offers the same picture quality from any angle.